Though not a Nicaraguan puro, Cohiba's Nicaragua cigars are the brand's first to be blended and hand crafted in Nicaragua. Made with the finest premium Nicaraguan tobaccos from Esteli and Jalapa, the medium- to full-bodied Cohiba Nicaragua is wrapped in a lustrous Honduran Jamastran Colorado Oscuro wrapper. Layered and sophisticated, the Cohibia Nicaragua delivers the complexity and strength of a Nicaraguan cigar with a bold, balanced flavor and notes of espresso, leather, sweetness, and pepper spice. 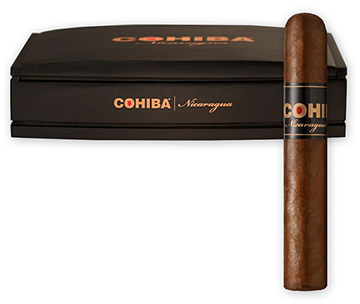 Enjoy a new dimension of taste with Cohiba Nicaragua cigars.